The Orange County Regional History Center has received one of three Diversity Grants announced recently by United Arts of Central Florida with funding from Duke Energy. 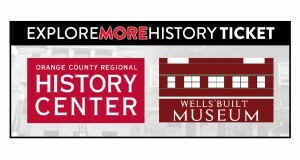 The $5,000 award supports “Bridging Audiences,” a new partnership between the History Center and Orlando’s Wells’Built Museum of African American History and Culture. The partnership invites guests to visit both museums through a joint $10 ticket. Beginning with July 14-15, the grant also enables the Wells’Built Museum to be open the second weekend of each month, on Saturday from 9 a.m. to 5 p.m. and Sunday from noon to 5 p.m. Tickets may be purchased here. “We thank Duke Energy and United Arts for this grant, which helps us forge even stronger ties with the Wells’Built, one of Orlando’s most significant cultural resources,” said the History Center’s manager, Michael Perkins. Like the History Center, the Wells’Built Museum is housed in a building of great historical significance. The museums are less than a mile apart, but they long sat on opposite sides of the racial divide that shaped the city during segregation. Both date from the mid-1920s, when the building that’s home to the History Center began as Orange County’s Courthouse and the Wells’Built began as a hotel, created by Dr. William Monroe Wells to provide lodging for African Americans. Over the years, many notable dignitaries, entertainers and athletes stayed at the hotel at 511 W. South St., including Thurgood Marshall, Jackie Robinson, and Ella Fitzgerald. Next to it, Dr. Wells also created the South Street Casino, where many of the great entertainers who stayed at the hotel long performed for Central Florida’s African American community. Restored in the 1990s by the Association to Preserve African-American Society, History and Tradition (PAST Inc.), the former hotel was placed on the National Register of Historic Places in February 2000 and opened as to the public as the Wells’Built Museum in 2001. Visitors to the History Center and the Wells’Built can purchase the joint ticket at either museum and can travel between them on the Grapefruit line of the free downtown LYMMO shuttle service (visit golynx.com). The joint ticket does not need to be redeemed on the same day for both locations. For hours and other details, visit thehistorycenter.org and wellsbuilt.org.